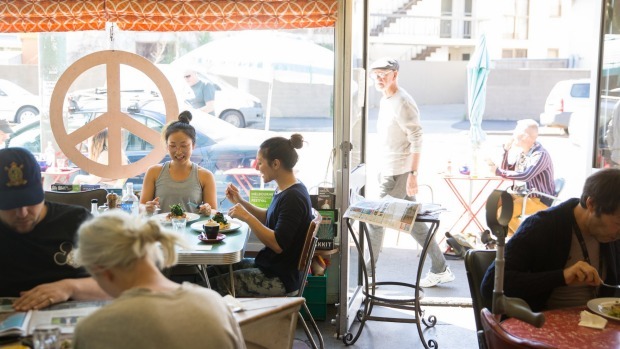 A really weird thing happened while I was at the Galleon, the 34-year-old cafe that is an enduring, endearing hold-out of a grungier, grubbier yet also gentler St Kilda. As if to signal that this treasured institution is a connection to another time, I looked around the open, colourful, trapezoid room and noticed that no-one was on their phone. It was so bizarre I almost whipped out my phone to document it. There were people flipping newspaper pages. There was someone with a biro in one hand, a coffee in the other, and a ring-bound thesis in front of them. There were other people talking while at the same time looking at each other – not creepily, just attentively. It was nice. Those retro vibes were reinforced by the Bakelite canisters on the rear wall, Laminex tables and mismatched vinyl-covered chairs, the caddies with plain salt and pepper grinders on each table, even the brown paper bag taped to the front door with a scrawled waitlist. 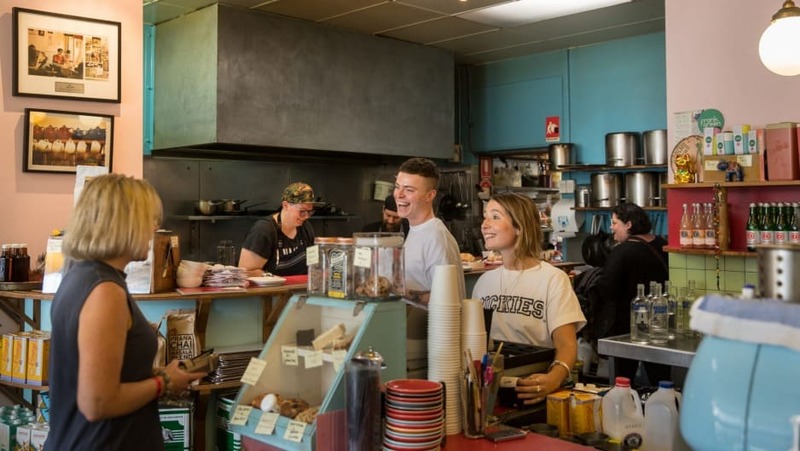 Because although the Galleon is vintage, it’s still incredibly popular whether it’s Tuesday breakfast, Thursday coffee or Sunday brunch and nowhere stays popular in Melbourne unless it’s also good. The Galleon’s cheery version of excellence means good coffee efficiently dispensed, well-priced cafe classics, prepared carefully but with little flourish. You’re unlikely to see any edible flowers within these walls. Instead, there are build your own breakfasts with eggs as you like and bacon that’s always cooked to a proper crisp. 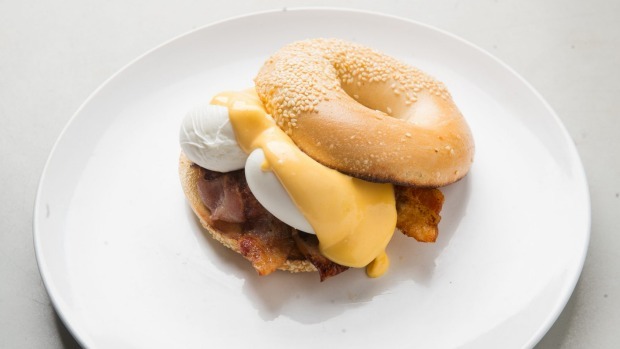 The eggs benedict comes with hollandaise as silky and rich as a St Kilda property developer, and there are thoughtful (and thoughtfully cheap) half serves of many items. Children are truly welcomed, not just with highchairs but with their own mini “big” breakfast and even Coco Pops, a hangover from the days when treats could actually be a nice big bowl of sugar, rather than an agave-sweetened pretend healthy “bliss” ball. 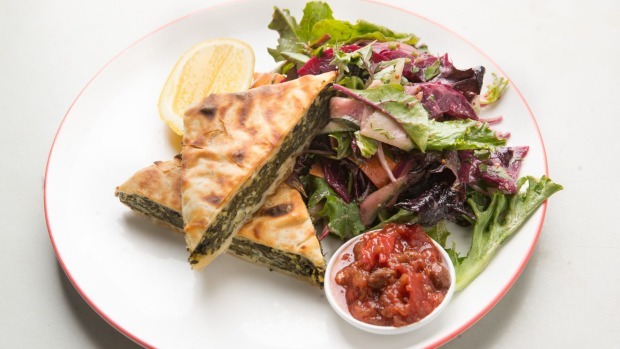 After 11am, there’s the ever-popular spanakopita, heavy on the spinach and sandwiched between buttery filo. The burgers and sandwiches are simple and packed with fresh, vibrant ingredients: no nonsense, full satisfaction. There’s kale in the smoothies, gluten-free desserts and almond milk for your coffee but there’s little concern for trending ingredients and the Galleon’s last (and third ever) Instagram post is from mid-2016, bless them. The wine list is a delightful three words: “red or white” available by bottle ($20) or glass ($8) but there’s a little more attention given to Bloody Marys. There are four types, the coolest of which is the Spanish Galleon with green olives and brine. St Kilda is backpacker central and a tourist drawcard but the Galleon maintains a community feeling. When I first came here 20 years ago, the noticeboard was aflutter with ads for share houses and bumper-stickered campervans. Now it’s more yoga classes, lost dogs and gigs at the nearby Memo. Still, there’s something about the cross-table chatter, the scuffed corners, even the righteous graffiti in the toilets that recall simpler times with more incense and less incensed anger at the world. It’s a happy place: St Kilda loves the Galleon and the Galleon loves her back. Long may she sail. First published in Good Food, 6th November 2018.